Recreational therapy, like any position in the health or medical field, is an ever-evolving concept which changes and grows with new technologies, new treatments, new studies and other developments in the industry. That is why many people who work in a position of recreational therapy are deciding to continue expanding their knowledge with continued education, even after they have achieved their degree (or multiple degrees) as well as certification. In fact, continued education is quickly becoming the norm rather than the exception for recreational therapists. 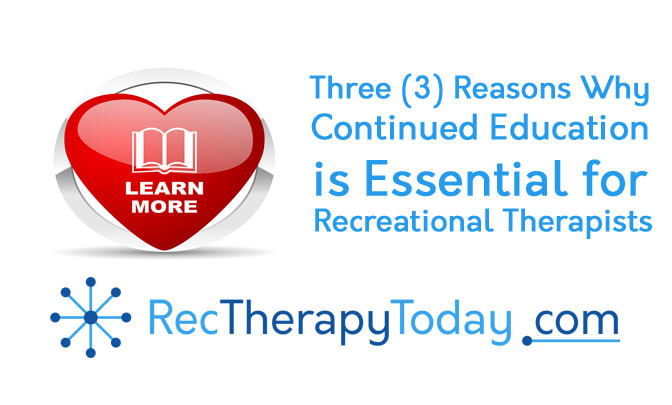 If you’re a recreational therapist but you’re unsure about taking continued education, consider the following 3 reasons why continued education is an essential step. The health and medical industry are constantly evolving with new and improved techniques, products and even services. If you avoid continued education, you may be missing out on techniques that could make your job easier and help improve your patients’ lives more effectively. When you take rec therapy CEUs, you are choosing to stay up to date on the latest innovations that will help your career and most importantly, help your patients. Continued education may seem like a daunting prospect, especially if you are still dealing with student loans, but it is relatively affordable. In fact, Rec Therapy Today posts free continued education webinars and courses for recreational therapists who want to refresh their memory, learn about the latest techniques and developments, and help further their career. Whether you’re hoping to impress your current employer or you are interested in working in a different recreational therapy setting, it’s no secret that employers prefer therapists who are willing to seek out continued education. Recreational therapists who are up to date on the latest innovations and who are willing to work hard for the sake of their patients.